There are many people in the United States that struggle with the effects of hoarding every day. If those affected do not get the help they need, their behaviors will create dangerous and unsanitary conditions in their homes that can impact the health and safety of them and their families. Hoarding is a mental disorder characterized by extreme anxiety and it is this anxiety that prevents those affected from throwing away anything they have collected in their homes. This causes a dangerous buildup of clutter that increases the risk of fires, injuries, and the presence of biohazard materials like mold and bacteria. ServiceMaster Restoration by Complete provides hoarding cleaning services in Middlesex County, NJ to help clear out hoarded items as well as clean and sanitize the home. We understand the sensitivity involved with hoarding cleaning and take a delicate approach that involves establishing trust with the affected individual and including them throughout the process. 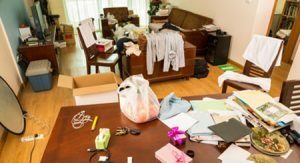 In most cases, the hoarding cleaning process must be initiated by someone close to the affected individual because hoarders rarely reach out for help on their own. Those that hoard may not realize the danger they are creating in their own homes and it takes a trusted friend or family member to help them realize the urgency of having their home cleaned and restored. The clutter of hoarded items may include newspapers, various knickknacks, and larger items like furniture and appliances. As the clutter grows, moving around the home becomes more difficult and the appearance of mold or bacteria growth becomes much more likely. At ServiceMaster Restoration by Complete, we can help clear the homes of hoarders of any unwanted items and we also fully clean and sanitize the home to create a safe living environment. We make our initial assessment of the damage the best we can without walking into the home. We discuss the cleaning process with the individual and their family and we may also refer them to a counseling professional if needed. We do not start the cleaning process until we have the trust and approval of the affected individual. We create a cleaning plan with the help of the affected individual to remove the clutter and restore the home to safe living conditions. After removing the hoarded items, we help clean and rearrange what is left. We leave the final say on what to do with each hoarded object to the affected individual and help ether throw away, donate, or recycle items that are not kept. We create a cleaning plan to help the individual maintain the home after the cleaning services are complete. We call the individual to check on their progress with the cleaning plan. If the home is cluttered again, we will return for further cleaning services. The condition of a hoarder’s home will slowly get worse until the home is cleared out, making it very important to reach out and help someone close to you who is affected by hoarding. ServiceMaster Restoration by Complete is ready to help those who struggle with hoarding throughout Middlesex County, NJ with our multi-step hoarding cleaning approach. We are available 24 hours a day at (732) 751-4004 to provide you with more information about our hoarding cleaning services. ServiceMaster Restoration by Complete helps hoarders in the communities of Middlesex County, NJ including Monroe Township, Perth Amboy, East Brunswick, New Brunswick, Piscataway Township, Woodbridge Township, Metuchen, Edison, and Old Bridge Township with our hoarding cleaning servces.